In this article I am using Kotlin to create a Pizza DSL. We can not really order a pizza with this but my intention is to develop a new DSL so we can configure a pizza and call order() on it so it prints pizza configuration on the console. This is a fun way to understand how DSL work and also we can learn some kotlin’s programming features. We are going to use below features of Kotlin to build this DSL. Kotlin have many features which are helpful in developing DSL’s so lets create a basic shell and then we will build-up our pizza API on it. <1> Initial Pizza class with only order function and it just prints the instance. Nothing much in this class. <2> Declared a pizza function which takes an extension function of Pizza and it returns a new Pizza instance. If you are new to extension function then read more about it here. <3> We are calling pizza function with out passing any thing to lambda and then calling order() on it. Pizza order starts by mentioning the size so lets create some functions to handle size of the pizza. <2> Implemented functions to handle each size: large and medium. These functions take extension function on Pizza then it sets the related size and then calls the passed function. <1> Declared enums to maintain Cheese level and Sauce types. <2> Implemented two functions to add sauce and cheese. These functions will just set the passed values into the class level fields. <3> Calling add function to add sauce and cheese. These functions are part of large pizza context. Allow users to add toppings and also what if users want toppings on one side? so lets implement this. <2> toppings will create new context to add toppings on the pizza. half will create new context to add toppings on half part of the pizza and add will take variable arguments to add toppings to the list. <3> call add by passing some toppings which are added to the list. <4> creates new context to add toppings on half side of the pizza. Display configured pizza information on the console. <1> Overload toString to return string representation of pizza instance. This will use multi-line string to return pizza details. 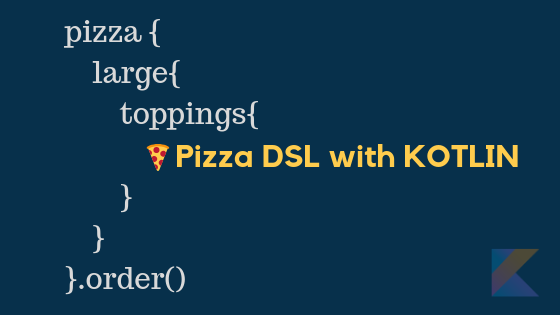 We used many kotlin features to develop pizza DSL. Using this DSL we can configure pizza and print its information to the console.